"The way I've lived, I know I'm lucky to be alive." 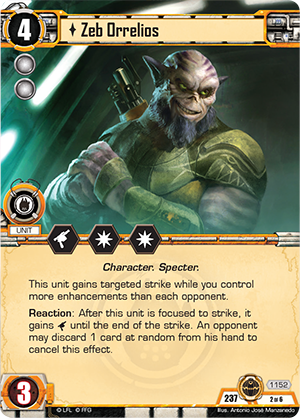 Allies of Necessity, the first Force Pack in the Alliances cycle for Star Wars™: The Card Game, is scheduled to arrive at retailers in just a couple weeks! 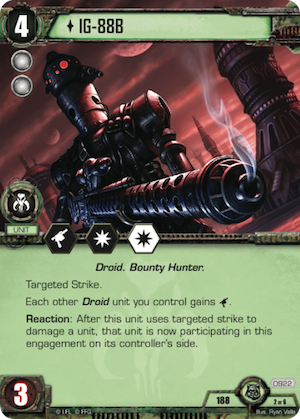 While many of its objective sets and cards explore the bonds of friendship that shaped the Star Wars galaxy, there are plenty others that turn their attention toward the tenuous bonds formed by credits, blackmail, and the fear of death. 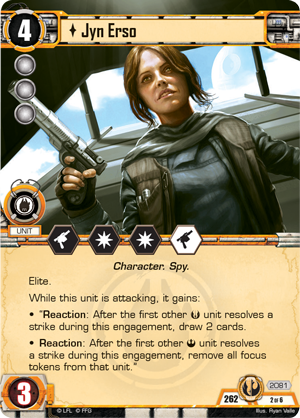 Light side players can celebrate the heroic partnerships formed out of desperation and shared by such characters as Jyn Erso (Allies of Necessity, 262-2) and Captain Cassian Andor (Allies of Necessity, 261-2). But there are plenty of other ways that characters and agencies can come to work together. 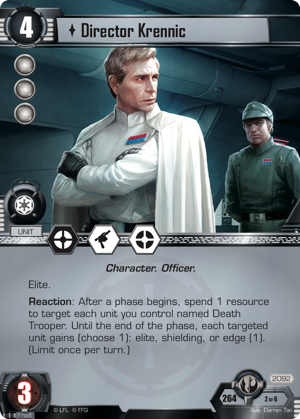 The Empire's hierarchical structure may force "alliances" upon Officers such as Director Krennic (Allies of Necessity, 264-2) and the Troopers under their command. 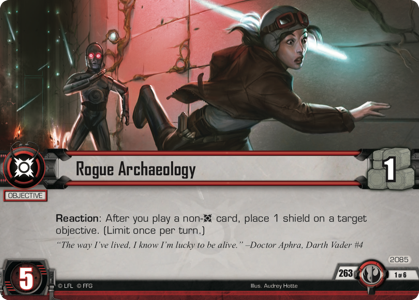 And Rogue Archaeologists such as Doctor Aphra (Allies of Necessity, 263-2) may simply stumble into the paths of Sith Lords willing to allow them to continue breathing so long as they can make themselves useful. 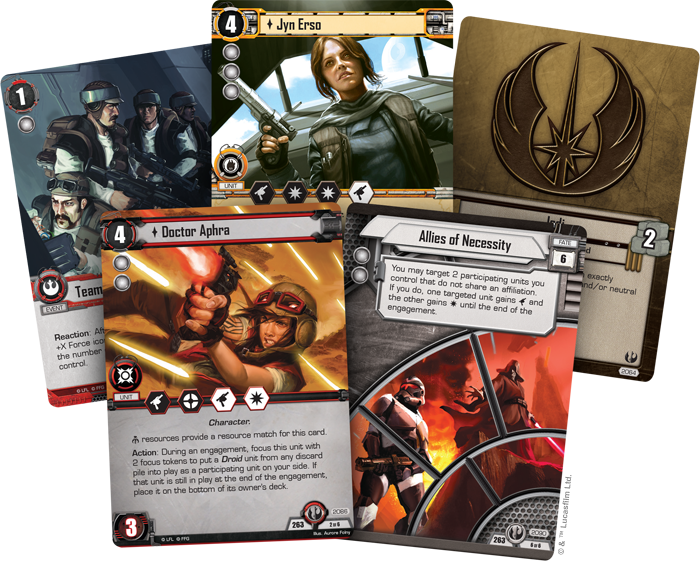 And in Star Wars: The Card Game, Allies of Necessity allows you to celebrate all these fateful partnerships not only by introducing a good number of the parties involved, but also by introducing two new affiliation cards for each affiliation. These come with potent abilities, but—in turn—require you to find creative means to satisfy their unique deck-building requirements. In order to get a better handle on just what these new affiliation cards might mean for the game, we asked two-time World Champion Mick Cipra to share his insights. As we expected, he had a lot to offer. 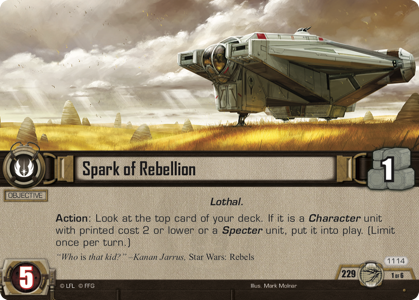 For me, the deck-building of Star Wars: The Card Game is a way to explore different ideas. The gameplay is a puzzle that I can spend hours enjoying. But I see both as ways to express my creativity. I’ve been playing regularly since the game's launch in December 2012. In the beginning, I would often build two decks and mash them up against each other to see how things would play out. This, of course, made edge battles rather interesting, but as long as you’re willing to entertain the idea of a split personality, I think it’s something anyone can do. By playing against myself, I was able to freeze at any point and think about all the different decisions each player has. And there are so many decisions during every game. One of the things that keeps me coming back for game after game of Star Wars is the vast number of choices each player has on every single turn. The fact the game allows players to draw to their hand size of six at the start of each of their turns means there’s always a multitude of options. Even the cards that don’t get played can be bid in an edge battle. And sometimes you have to choose whether you should play less so you can bid more. The most competitive decks, of course, each have a game plan of what they want to play each turn and how they want the board to develop. But between the sheer variance of draws and the fact that no plan survives first contact with the enemy, I can confidently say no two of my competitive games have ever played out exactly the same. And I love it when games are so back-and-forth that neither my deck nor my opponent's can hit its stride. 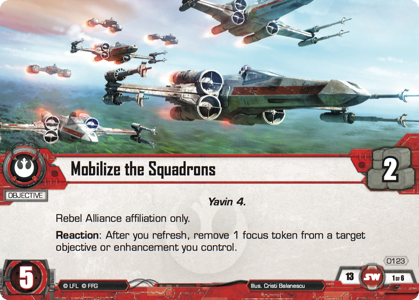 The two most important tactical skills a player has to hone in Star Wars: The Card Game are 1) risk analysis and 2) order of operations. 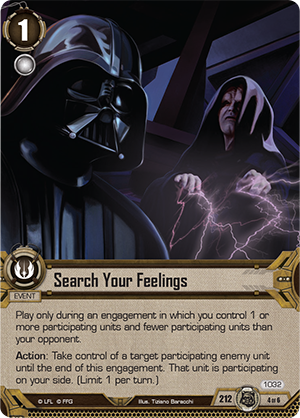 The same could probably be said about any card game, but it’s different and perhaps doubly important in Star Wars because of the uncertainty introduced by the edge battle, and the alternating striking of units in combat. When players start out, they tend to risk too much in engagements and get blown out when the edge battle doesn’t go their way. Or they strike in an order that produces a suboptimal outcome. If you’re starting off, I encourage you to think of the game primarily as a game of board control. 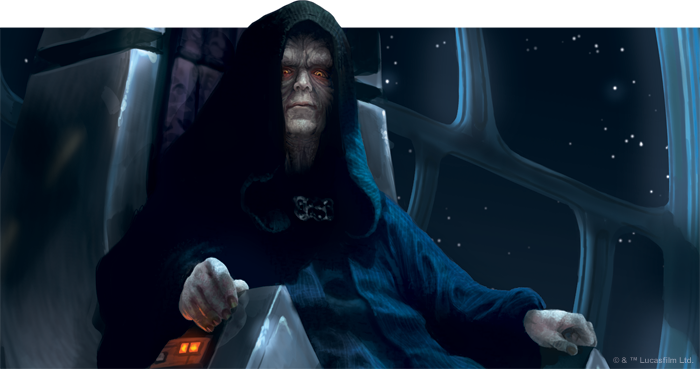 If you control the board you can, as light side, destroy three dark side objectives or, as dark side, tick that dial up to "12" at your leisure. Everything you do should be about maintaining your board presence and controlling your opponent's. Don’t risk too much too early, and look for the most devastating way to resolve your combat icons or play an event. It’s ok to play your game at a measured pace. If your chances for success this turn look grim, you can always get a new hand full of options next turn. You’re not trying to win a battle; you’re trying to win a war. 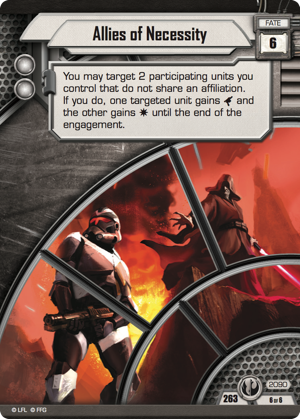 In Star Wars: The Card Game, the most strategic choice you'll make in an event is which decks you'll bring. There are hyper-efficient units and super-synergistic sets out there, but even if you have perfected when to attack and how to resolve your icons, you might lose to an opponent who hasn’t if you’re simply not playing the best cards. So why not just run all the best cards? Because… IT’S A TRAP! Ok, now that I’ve got that out of my system, what does it really mean? There are very powerful cards in the environment that will make up the core of any champion-caliber deck. But they can’t fill the deck. They still need support in the form of economy or events or fate cards. No archetype is pigeonholed into 100% of their slots. 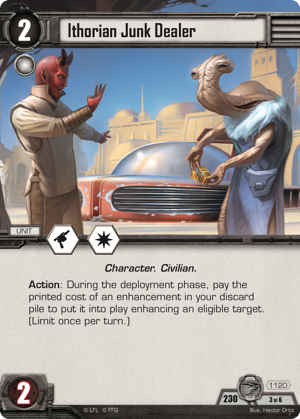 There are always flex choices and different lateral moves to make, and this is where I see the most creativity happening in Star Wars: The Card Game. I love seeing what other players bring in to flesh out their World Championship decks. Do they go for raw efficiency, pod synergy, or surprises? Personally, I love a good surprise. It's the idea of a good surprise that brings us to my World’s winning light side deck. 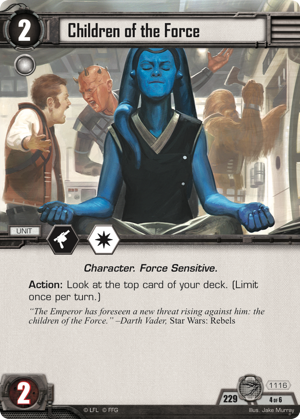 Just like my 2014 Worlds light side deck, my Worlds 2017 light side deck was built off a known archetype. 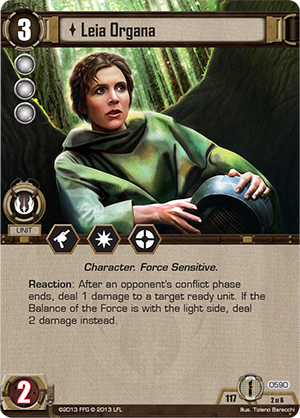 The 2014 deck was built off a slow-build Jedi Leia (It Binds All Things, 117-2) deck that tries to control the board, and the 2017 deck grew from a Spark of Rebellion deck that tries to build a massive board. 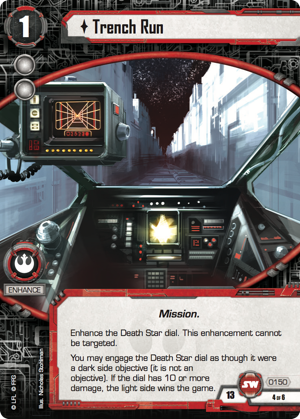 The surprises in the decks were the inclusion of Deep Commitment (Darkness and Light, 122-1) and Mobilize the Squadron (Core Set, 13-1) in 2014, and Sacrifice at Endor and—to a lesser extent—Haunting the Empire in 2017. 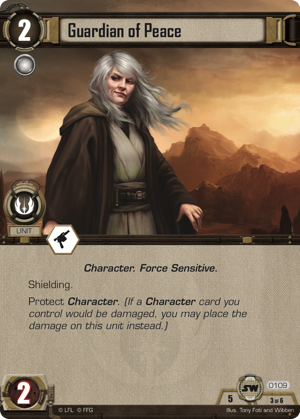 To say these were surprises is a little misleading because there’s so much information available in a game of Star Wars: The Card Game, that very early in a match, my opponent would know I’m playing these cards and my deck's general plan. It’s not like the surprise offered by one-card counters in other games. The surprise is that I would even bother to run these objective sets in a Worlds-level event to begin with… and the reason for that is three-fold. One: The objective sets were very synergistic with other things the core of the deck was already trying to do. 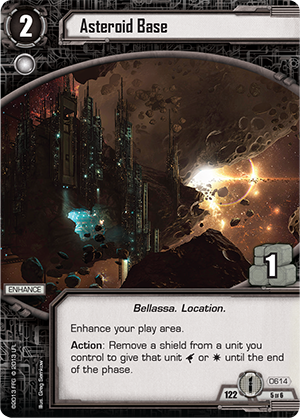 Back in 2014, Asteroid Base (Darkness and Light, 122-5) could turn any shield into a blast or a gun without limit, and the Deep Commitment objective set plus four Guardians of Peace (Core Set, 5-3) ensured there were plenty of shields to go around. Because all of the deck's sets had lots of very cheap, small units, I could build the deck until I hit a mass shielding event and go crazy with bombs galore—all funneled into one glorious Trench Run (Core Set, 13-4). My Spark deck wanted more targets it could Spark into play—which meant Hera Syndulla and Ewok Hunters. 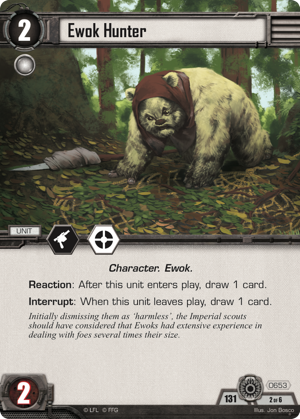 Ewok Hunters provided a nice synergy because they could change the top card of the deck resetting my opportunities to hit something with Spark of Rebellion. They also worked well with Hera because she would get them up to two guns, which helps when you need to attack an otherwise overwhelming Navy fortress. The Phantom and the Ghost, too, offered nice layers of protection to keep my big units on the board, and Unexpected Assistance worked well in the few instances where I needed to strike big with a main. My personal favorite inclusion from the Ewok set, however, was Funeral Pyre. It added a lot of control, and in a Spark deck, there’s no lack of units who can be put on the pyre. 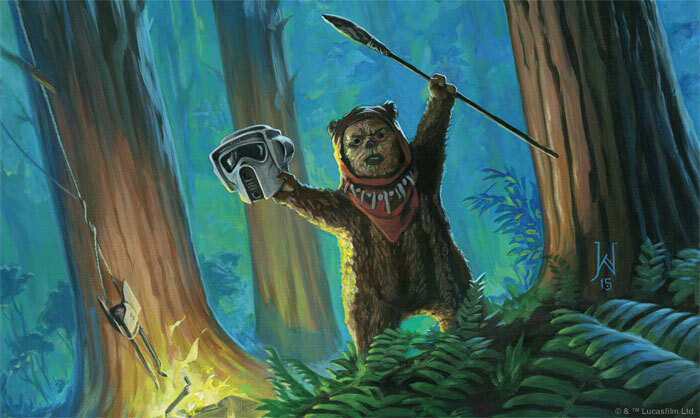 Sacrificing your Ewok Hunters to reset the top card of your deck is just pure synergy. Two: The inclusions actually are surprising. Unless a player has dug really deep in their playtesting, they may not have come up with the idea to include such sets to flesh out their core strategies—much less actually play any games with them. Of course, the sets have to be strong enough to hold their own if people know what you’re trying to do, but by running unusual sets, you can sometimes force people to confront situations they hadn’t planned for. The more chances I have to create a situation where my opponent makes a mistake, the better. Three: The inclusions are funny. Hurling Ewoks and lizards into the Death Star’s exhaust port or inconveniencing Emperor Palpatine by burning the fallen on a Funeral Pyre appeals to my sense of humor. 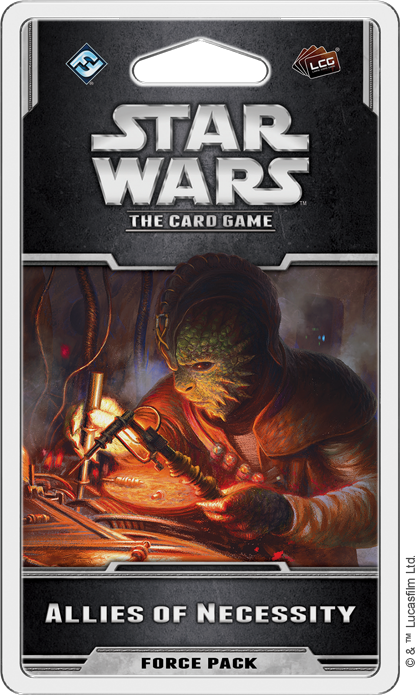 Star Wars: The Card Game can be a funny game, and players should revel in the bizarre situations they are able to create. So how do you find these hidden gems and determine if they’re good enough to include in your worlds deck? You play a lot of games. You play a lot of games with as many different cards during the competitive off-season as you can. 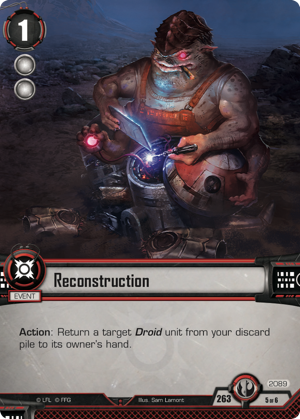 I had been working with Funeral Pyre for awhile and had been revisiting the idea when Ithorian Junk Dealers (Galactic Ambitions, 230-3) and Search Your Feelings (Redemption and Return, 212-4) came out last summer. 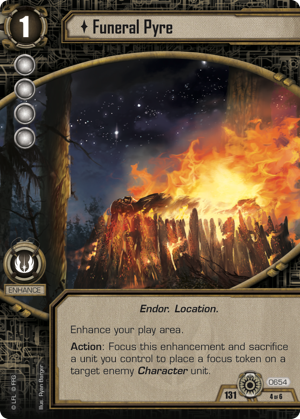 Those decks didn’t quite pan out, but they made me more familiar with the Sacrifice at Endor objective set, so when Haunting the Empire came out, it seemed like a natural inclusion to finish out a tri-color Spark deck. What Will You Make of Your Alliances? Let me ask you this: When new cards come out, what do you see? The light? The darkness? The balance? 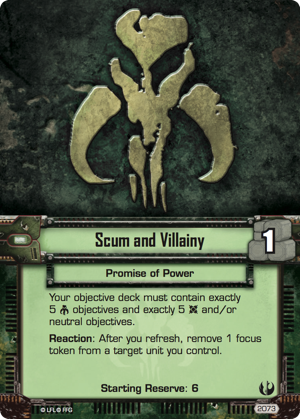 As we are nearing the release of the Alliances cycle, FFG asked me to see what creative deck ideas it might open up, and man—oh man!—are we in for a great Force Pack! When I first get any new pack, I tend to mash several of the sets together—just to see how the cards play. But I also throw in some older sets that have fallen out of the competitive scene to see if their time has come. My goal is first and foremost to get a working experience with the cards. If you do this, you won’t come up with the greatest deck right away… and will likely lose a lot. But some cards might surprise you, and that’s what you want to store in your memory to look for synergies later. As for me? This will be where I will start with Allies of Necessity. I want to run this deck because I want to test how well this fifty-fifty, split-affiliation card works. 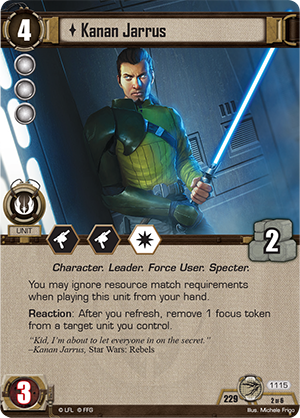 For the deck-building puzzle, the affiliation card lets you remove an additional focus during refresh. 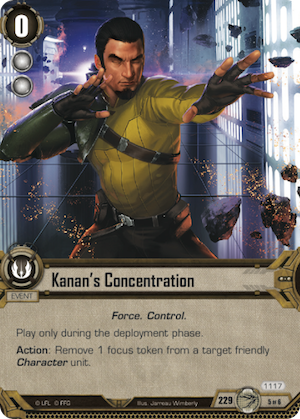 This is a big effect for the dark side as it will make it harder for the light side to use tactics and strike sequences to lock down your best blockers for an additional turn. It will also let you commit any non-elite unit on your first turn and then block with it without it getting locked out on your second turn. 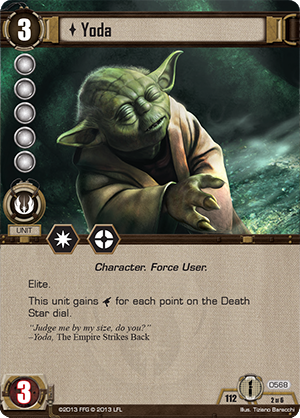 Promise of Power has additional synergy with Doctor Aphra. 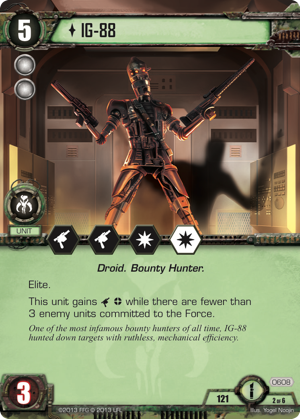 She isn’t elite, but she has a double-focus cost to bring Droids into play from discard. 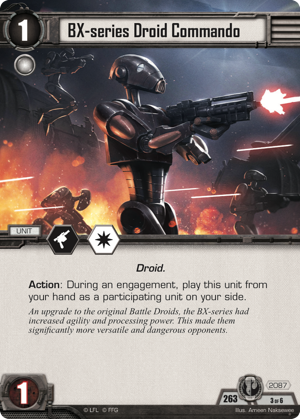 So Promise of Power allows me to pay this cost every turn, and if I’m trying to bring in Droids every turn, I want to have a good droid to bring into play. IG-88 fits this bill. He’ll often have three black guns and a black tactics, making him a great blocker. The problem is that when IG-88 survives his engagement, he’s then put on the bottom of the deck. So how does a wicked smart Doctor get more than a single strike with the cold, metallic assassin? She sells him on the Black Market Exchange after he strikes! 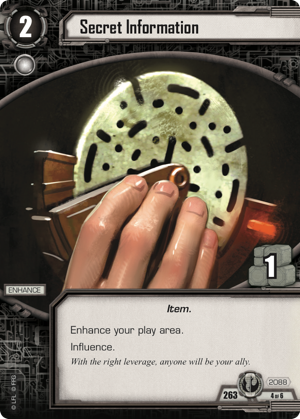 By selling IG-88 to the discard pile, Doctor Aphra ensures she'll be able to summon him again. 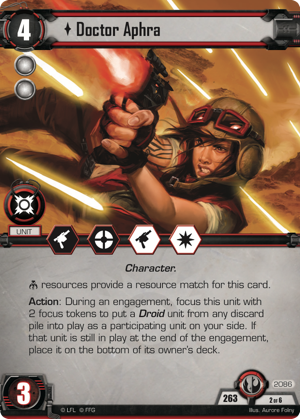 And, accordingly, this deck has dreams of looping IG-88 and other Droids with a Doctor Aphra who has the Emperor’s Favor. Will it be a good deck? I don't know, but it sounds hilarious! 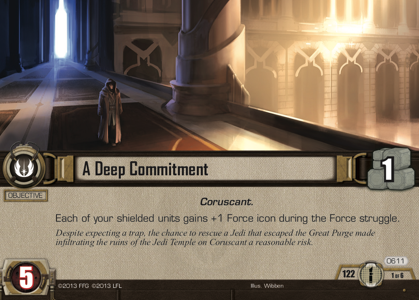 Star Wars: The Card Game is full of surprises, and you'll be able to pursue even more of them when Allies of Necessity. What else can you do with its cards beside tinkering endlessly with a psychotic assassin droid? 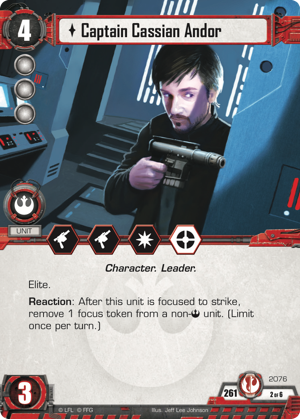 The Force Pack's ten new affiliation cards are sure to prompt all kinds of new deck-builds, and two-time World Champion Mick Cipra will be back with two more of them! 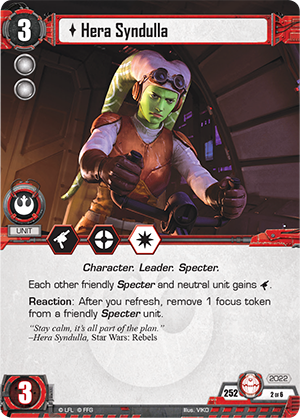 Allies of Necessity (SWC37) arrives at retailers Thursday, July 6th!